We’re using our customers to overcome one of the biggest challenges in marketing. Here’s how. Two weeks ago, a production crew from LessFilms traveled from Florida to New York City. There, they spent an afternoon filming, first at the Museum of Modern Art, and then at the studio of entrepreneur Nick Gray. Why did this shoot happen? Because LessFilms is our video agency, and because Nick is the CEO of MuseumHack, a Groove customer (and a business that offers insanely cool museum tours and company team building activities). And because lately, we’ve been spending a lot of time focusing on telling the stories of our customers, and we’re finding that the payoff has been tremendous. We’re going to be using this video—along with others like it—in a lot of places. It’s a small part of our recent efforts to capture and tell more customer stories. Today, I’m going to share this story collection has been so valuable to us, and some of the ways that you can do it, whether you have a production budget or not. Only early adopters actually want to buy and use products that nobody else is using yet. The majority of the market needs to know that others trust you; they won’t be the first to take that chance. Showing them that others do, in fact, trust you with their business—and in fact love doing business with you—overcomes a huge objection that most people have about working with startups and small businesses. It’s easy to talk about the benefits that your product offers. But it’s hard to do it in a way that will resonate with every potential customer. Customer stories help you do that. 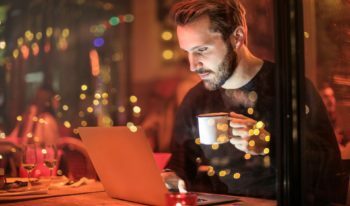 “Spreading the word” about your business keeps many entrepreneurs up at night. Marketing isn’t easy, and often seems like an uphill battle. So when someone shares your story with an entirely new audience—for free—you appreciate it. Customers love it when you talk about them, and it builds incredible goodwill in those relationships. Goodwill that leads to higher customer lifetime value, more referrals and just generally happier customers. 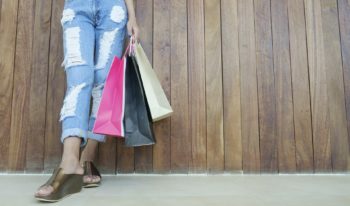 Good customer stories can have a big impact on conversions. But what’s a good story? Hint: it’s not a fluffy, gushing “Groove is amazing and changed my life” statement. It’s much more nuanced than that. I encourage everyone to read Sean D’Souza’s two-part Copyblogger series on The Secret Life of Testimonials (Part One and Part Two), but what we’ve found is that the best-testing testimonials are specific about who the testimonial writer is, and what problem Groove solved for them. The first part helps the reader put themselves in the shoes of the testimonial writer. As a SaaS founder, I’m a lot more likely to relate, for example, to Allan Branch, another SaaS founder, than the anonymous “John S., Boston, MA” that I see offering up testimonials all over the web. The second part, specificity about a problem, demonstrates to the reader not just that your product is generally good (that’s not enough), but that you can solve their problem. 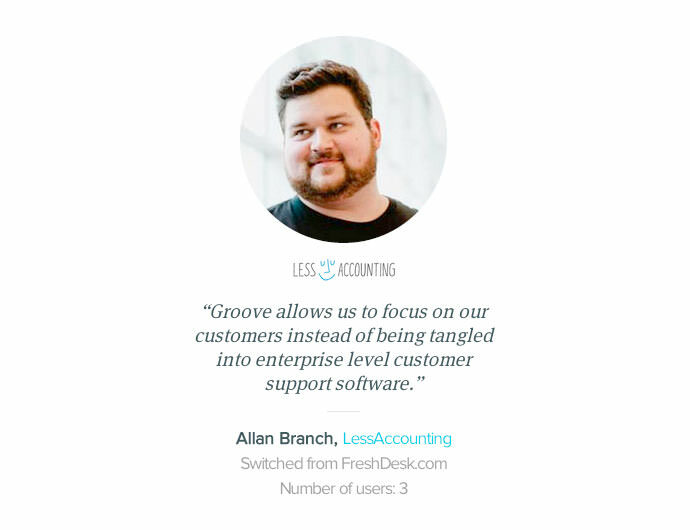 In the example above, one of the most pressing problems we’ve found in our customer development is that enterprise help desk users feel bogged down by the complexity of the software, so we need to make sure we hit that pain point in our customer stories. NPS Surveys: Customers that rate you a 9 or 10 are indicating that they’re already highly likely to recommend you to others, so this should be an easy ask. Support Tickets: Customers who send you positive feedback on their product usage or support interactions are also indicating that they’re happy with you, which makes it a great time to reach out to them for a story. This email can be revised depending on the type of story you’re looking for (feel free to steal it), but notice how we don’t just ask for a testimonial, but walk them through the steps required to hit the most important traits of a great testimonial. I’ve written before about how powerful video testimonials have been for us; it was part of a redesign that more than doubled our visitor-to-trial conversion rates. Video tells a story with a richness that words and pictures can’t match; in terms of helping a prospect visualize themselves using your product, what could be more powerful than actually showing someone like them doing just that? A good video agency that specializes in customer and demo videos is an asset here, as they’ll walk you through the process from start to finish, and know how to capture the best stories based on what you know about who your prospects are and what they want. We’ve worked with LessFilms for years now, but there are many agencies out there that do great work. Expect to spend at least a few thousand dollars here, which I know isn’t cheap; but if your experience ends up like ours, the investment will be worth it. Capturing a customer story—in the customer’s words—in a quote is a valuable way to add more social proof to your website or other marketing materials. We have them peppered throughout our own site. 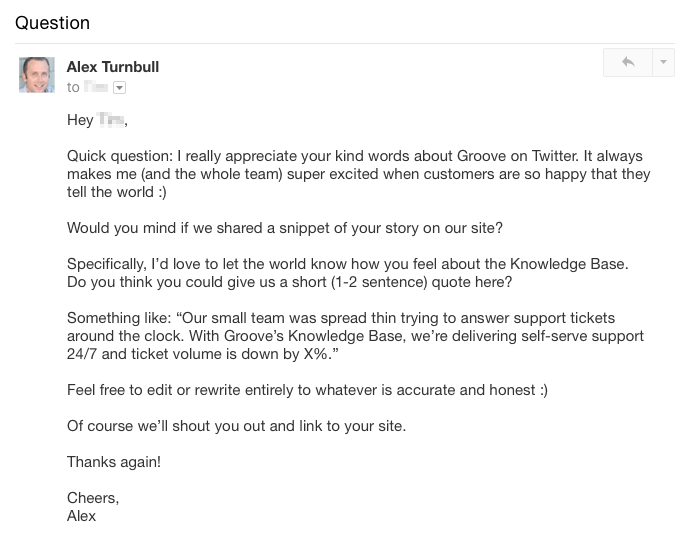 Just remember, this rule can’t be overstated enough: “I LOVE GROOVE!” is not a good testimonial quote. Specificity and problem/solution framing are key. A customer’s logo on your website, even though it’s a simple image, still tells a story. That story is that “I trust this company enough to give them my business.” It’s a very simple story—probably the most simple story, when it comes to these types of things—but it can be powerful. These are most powerful when the prospect viewing the site either sees the logo as representing a company that is just like them (visualization), or a company that they look up to and respect (credibility). 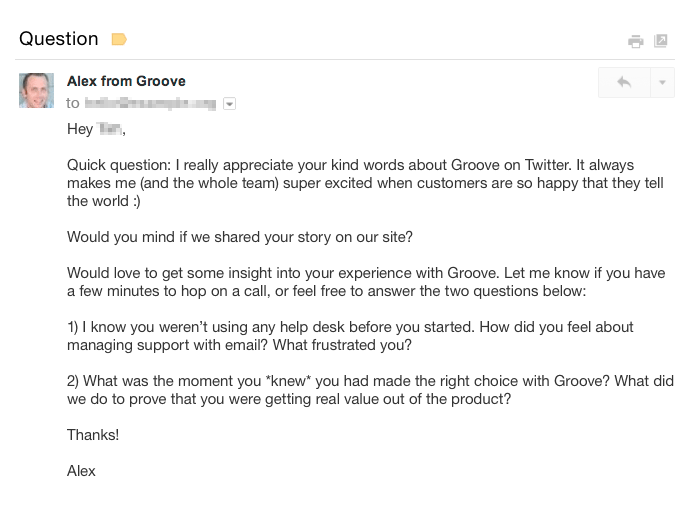 We also share case studies of how different customers use Groove on a dedicated section of our site. 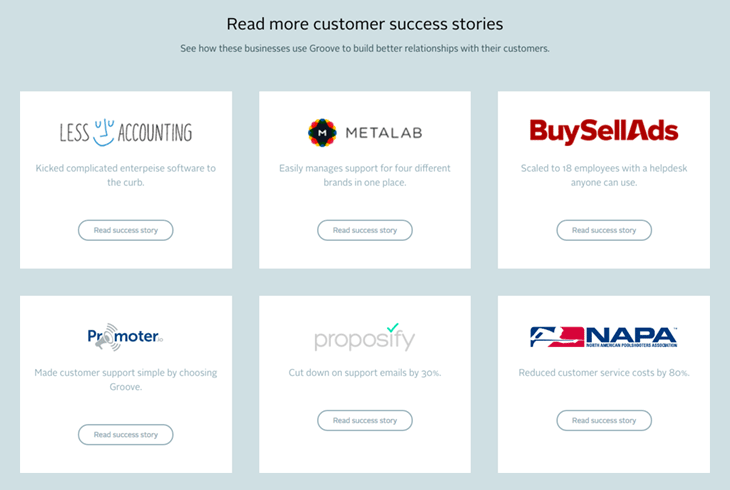 These come from 20-30 minute conversations with these customers about how they use Groove and the specific challenges they’re solving and the features they use most to solve them. These help to overcome the “that’s great, but will it work for us?” objection by going deep into each customer’s specific needs and how Groove meets them. If you’re not already capturing and sharing customer stories, then I hope that this post inspires you to do so. And if you are, then I hope that you’ve gotten some new ideas on how to do it better. 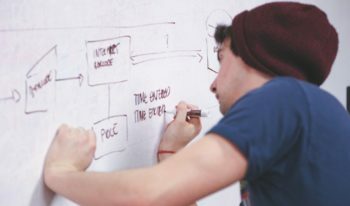 Helping your prospects visualize themselves using your product is a massively important part of marketing, and pulling back the curtain on our existing customers has, for us, been a very effective way to do that.